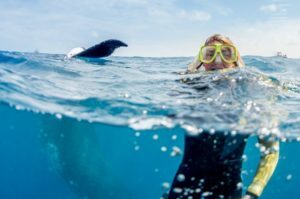 The owner of Reef & Rainforest, Jenny Collister, recently led a group to Tonga to swim with the Humpback Whales. Snorkeling with whales in Tonga has always been on Jenny’s bucket list. This was an exciting charter right from the start on board the Nai’a. The first venture out on the skiffs gave the group one particular little whale who was so playful the group had to launch themselves out of the way. Jenny, as group leader, was given the honor of naming the calf and came up with Beazy (baby + easy = Beazy). This was just one of the spectacular encounters that continued throughout the week. Tonga is unique destination for animal lovers where you can have such great interaction with the humpback whales. The group loved the trip and experience so much many are planning to join Jenny again on her Nai’a Charter in 2021.